In 2015, we really focused on beefing up our platform. We added tons of new text marketing features and packed our learning center with content galore. We don’t want to just sell SMS. We want to sell success. We want every new user to observe immediate results, thanks to our platform. On top of our optimistic and forward thinking attitude, here’s a few reasons why our online texting service is second to none. We never pressure you into signing up for something you won’t use or can’t afford. First things first, we offer a free plan for a reason. If you’re not familiar with SMS, don’t go signing up for our largest plan. I mean, grant it, we do appreciate your business, but we’re looking for long term customers. We want you to steadily grow with our service. We don’t want you overwhelming your brain and budget with a plan size that’s too big for your current needs. We empower our customers with tons of educational resources. We recently built a stacked learning center. It’s packed to the brim with helpful infographics, guides, videos, blog posts and more. We cater to the unique learning preferences of our customers. If you don’t feel like combing through a dense guidebook, take visual cues from an infographic that explains the same concept. We never want our content to overwhelm you, so we work hard to make every concept easy to understand. Our customer support team will never leave you hanging. We go above and beyond the customer support call of duty. We’ll spend an hour on the phone with you, walking you through the basics of our service. If you run into an issue, we’ll fix the problem ASAP. We won’t just charge your card and disappear. Here’s the deal. To most, text marketing is a fairly new concept, and requires above and beyond attention. We want you to become a text marketing pro, not an average SMS Joe. 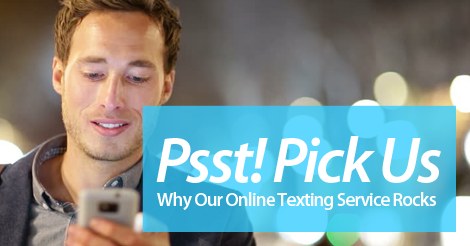 Join forces with top online texting service, Slicktext.com in 2016. We want to help you grow your business with one simple text campaign. Give us a buzz at 1.800.688.6290 or head over to the pricing page and sign up for a free plan. Our platform is top of the line, and our customer support team is always ready and willing to help you every step of the way.